Model Cars Magazine and Galaxie Limited have partnered together to bring you one of the most innovative model car building contests ever! 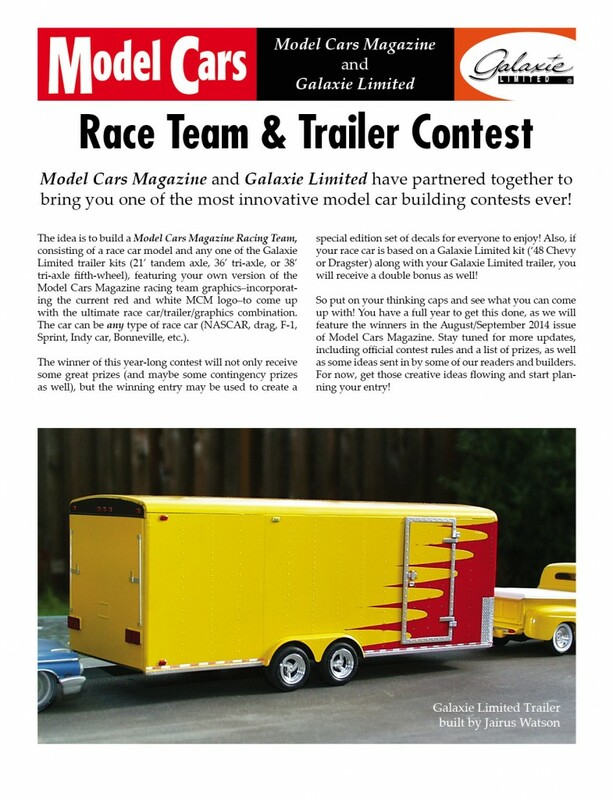 The idea is to build a Model Cars Magazine Racing Team, consisting of a race car model and any one of the Galaxie Limited trailer kits (21’ tandem axle, 36’ tri-axle, or 38’ tri-axle fifth-wheel), featuring your own version of the Model Cars Magazine racing team graphics–incorporating the current red and white MCM logo–to come up with the ultimate race car/trailer/graphics combination. The car can be any type of race car (NASCAR, drag, F-1, Sprint, Indy car, Bonneville, etc.). The winner of this year-long contest will not only receive some great prizes (and maybe some contingency prizes as well), but the winning entry may be used to create a special edition set of decals for everyone to enjoy! Also, if your race car is based on a Galaxie Limited kit (‘48 Chevy or Dragster) along with your Galaxie Limited trailer, you will receive a double bonus as well! So put on your thinking caps and see what you can come up with! You have a full year to get this done, as we will feature the winners in the August/September 2014 issue of Model Cars Magazine. Stay tuned for more updates, including official contest rules and a list of prizes, as well as some ideas sent in by some of our readers and builders. For now, get those creative ideas flowing and start planning your entry! 1) The race team MUST use any of the Galaxie Limited trailer kits. 2) The trailer MUST have the MCM logo on it. Art work for the logo can be found at the MCM web site www.modelcarsmag.com Once on the site click on “Contests” in the menu, in the black bar at the top. That will take you to the contest information. Scroll down and you will find downloadable art for the red and white logo and the logo with the Mercury, either logo is acceptable. 3) The race vehicle can be anything you want, even a race boat. Putting the MCM logo on either the race or tow vehicle is optional. If either the race or tow vehicle are made from any Galaxie Limited kit the winner will qualify for additional prizes. 4) The trailer may be modified, but must be recognizable as a Galaxie Limited trailer. 5) Using a tow vehicle is optional and not required. 6) All entries must be in our hands by July 1, 2014. After that date no entry will be considered for any of the prizes. Submit your photos via e-mail or mail on a disc to us at contest @ modelcarsmag.com or Model Cars Magazine, Photo Contest, P. O. Box 89530, Honolulu, HI 96830. Remember to allow enough time for delivery if you use regular mail. The rules are simple and designed to allow you to be as wild or mild as you want. Think out of the box and be creative. Wild paint schemes, create your own version of the MCM logo, it’s up to you. We are putting together a bunch of cool, fun prizes for the winners. Good luck and get busy building.